Posted on Jun 17, 2015 by Appleton Downtown Inc.
“We are the music makers, and we are the dreamers of dreams”. 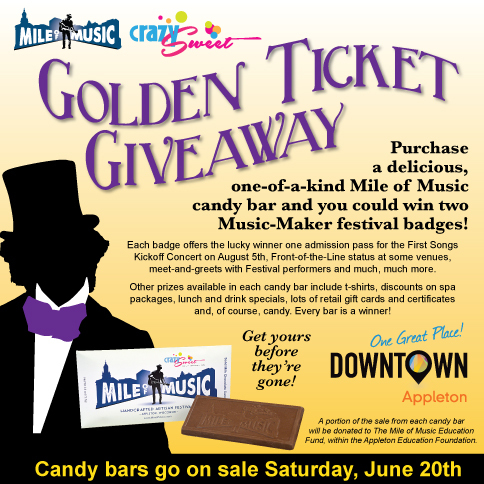 These words uttered by Gene Wilder in Willy Wonka and the Chocolate Factory, could have been written for the upcoming Mile of Music Golden Ticket Giveaway put on by Crazy Sweet, the candy store on College Avenue in Appleton. Co-owners Dale Ver Voort, and his wife Mary Kelley, have put together a promotion that Willy Wonka himself would be proud of. Coloma based chocolatiers R & R Chocolates hand poured five hundred custom candy bars with the Mile of Music logo imprinted into it. The bars were wrapped in foil and put into a custom package along with hundreds of prizes donated by downtown Appleton businesses. The “golden ticket” prize is two Music-Maker Festival Badges. Each badge offers the lucky winner one admission pass for the First Songs Kickoff Concert on August 5th, Front-of-the-Line status at some venues, meet-and-greets with Festival performers and much, much more. “Mile of Music is an event unlike any other, we were looking for a way to be part of the excitement of that weekend” Dale said, “the fact that so many downtown retailers are joining us is part of what makes Appleton one great place”. Other prizes available in each candy bar include t-shirts, discounts on spa packages, lunch and drink specials, lots of retail gift cards and, of course, candy. In keeping with the spirit of Willy Wonka, a portion of the sale from each candy bar will be donated to The Mile of Music Education Fund, within the Appleton Education Foundation. This program funds more music opportunities within the Appleton public schools. “Being able to give something back to the community, especially something that helps fund music education, is important to us. Who knows, some of these kids may be playing at the Mile of Music event one day”. You can purchase the candy bars starting Saturday, June 20th at Crazy Sweet.